Born and brought up in Bangalore, Santoshi has over 17 years of IT experience between Motorola and Thomson Reuters. 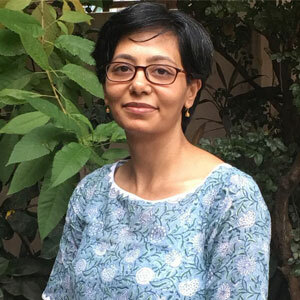 She has a Masters in Computer Applications from Bharatidasan University and a Post Graduate Certification in General Business Management from XLRI. She believes in the nurturing leadership style, enabling people to flourish by helping them discover their abilities. She is an enabler and an eternal optimist. Her skills include project management, people management, building teams and stake holder management. Currently on the journey of becoming a changemaker, she is at the intersection of exploration and decision making. She left the corporate world in Feb 2017 and is now working on acquiring the skills required to work in the social sector. With her experience of corporate life and the skill-set that she gains from the Amani Social Innovation Management program, Santoshi intends to make enduring changes in the area of support and care services for senior citizens, women and children.Santoshi enjoys driving her kids to school/classes, catching up with friends, people watching, theatre, movies and travelling.